This strategy involves two indicators which the entry signals, a kind of OBOS. The first one is TMA and the other is PA ( Reversal Pin Bars, Engulf Bars, etc). If the signal is spotted, you will use then the pending order. 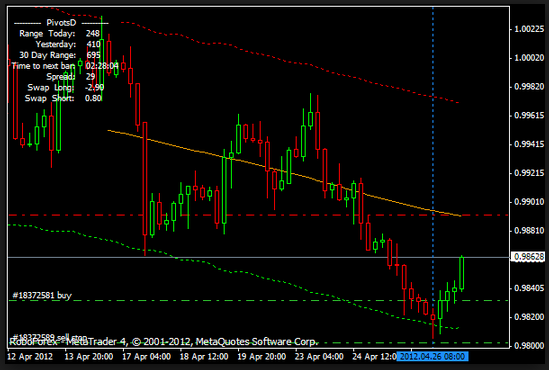 This can be traded at all pairs, since you can use D1 chart for the signals that don’t come always. This strategy comes with three platforms installed to watch all pairs and trade which ever pair gives a signal. You may want to try this one if you are looking for the “Holy Grail” since I believe that what goes up must come down and IMO SL is a tool broker used to steal money; therefore what we really need is a good money management. Risk is inevitable that is why you should know when to enter and when to close that position and of course a good MM to support. In Forex Trading, if there is no risk, there is no reward.